Our three airports must be significantly improved in order to meet growing demand and keep the region globally competitive. John F. Kennedy International Airport should be expanded and modernized to include two additional runways, larger and more customer-friendly terminals, and significantly better transit access. Newark International Airport should be reconfigured, moving the main terminal closer to the train station on the Northeast rail corridor and freeing up more space to eventually construct a new runway. These improvements could accommodate a 60 percent increase in airline passengers, and reduce delays by 33 percent. Today, our three major airports rank first, third, and fourth for worst delays in the nation. And while air passenger travel demand could increase 60 percent in 2040 (and double by 2060), it is obvious that our airports will not be able to meet that demand and keep us competitive on the global scale. Unfortunately, expanding any of these airports presents major environmental challenges for adjacent communities and natural ecosystems. The customer experience—from access to the airport to amenities inside the terminals—is also uneven and subpar when compared with international peers. Even with the success of AirTrain at JFK and Newark, transit access to the airports is not optimal, and traffic congestion on nearby roads and highways makes flying even more uncertain and time-consuming. Climate change poses an additional challenge to our airports. Teterboro Airport, currently the airport of choice for general aviation flights (primarily corporate business flights), will likely need to close later this century due to the risk of rising sea levels. Many improvements could help reduce delays and handle additional passengers at JFK, Newark, and LaGuardia, including implementing new air traffic control technology, improving intercity rail service, and expanding service at other airports in the region. But the only thing that would significantly increase capacity at these major airports is building new runways. Of the three airports, LaGuardia is the most land-constrained and lacks the facilities for international service, while JFK and Newark are better suited for expansion—which will be necessary to accommodate the anticipated overall growth in air travel, and to absorb both the many commercial flights from LaGuardia and those displaced by the closing of Teterboro. 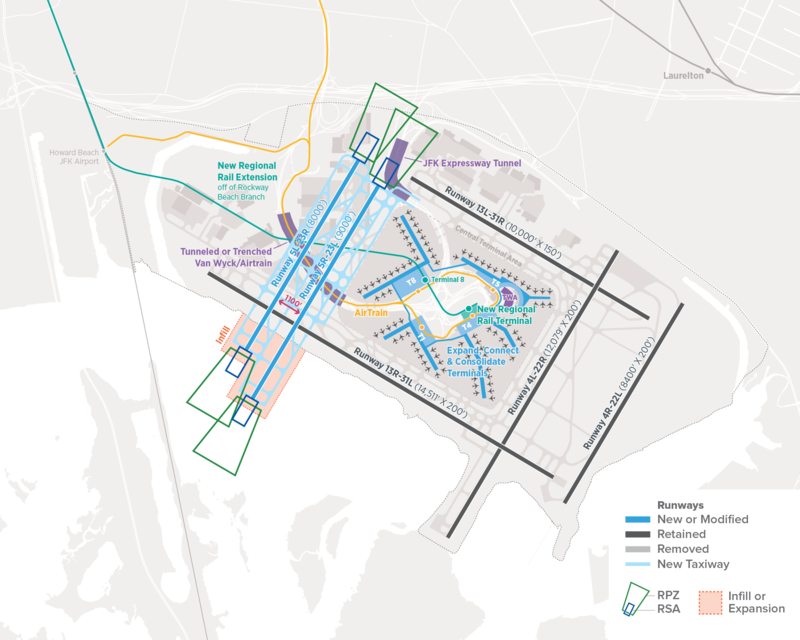 JFK will eventually need two new runways, larger, better-designed terminals, and new transit service that supports a one-seat ride through to Manhattan. The plan must include protection from storm surges, and the restoration of Jamaica Bay. Construct a new 9,000-foot departure and arrival runway west of the terminal area. A second 7,000- to 8,000-foot arrival runway will eventually be needed either adjacent to this western runway or between the two eastern runways. All new runways should be built to minimize the impact on Jamaica Bay. Consolidate the six existing terminals into four larger common-use facilities, with all gates available to all airlines. Reconfigure the central terminal area to improve service with open and spacious terminals, business centers, and customer amenities that would be competitive with cities such as Singapore, Amsterdam, Madrid, and London. 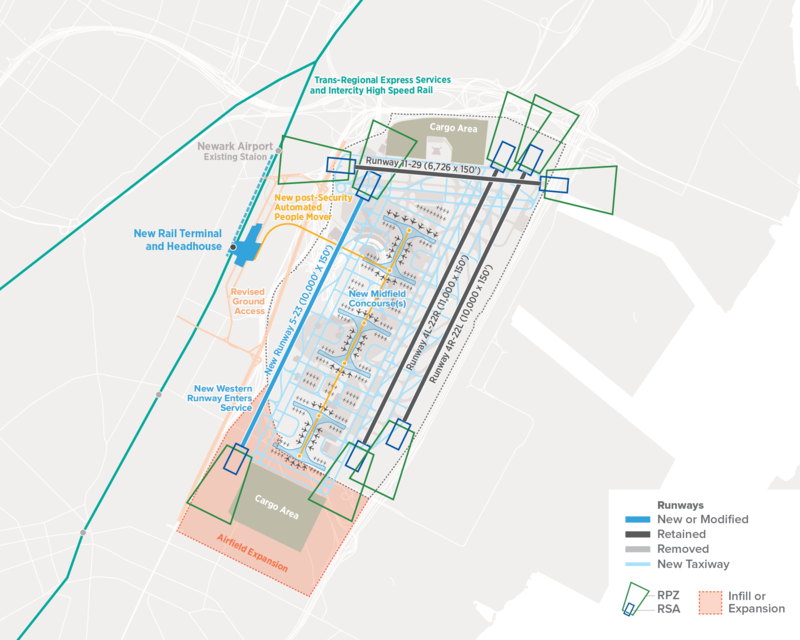 Rebuild and expand on-airport AirTrain stations at JFK: Parts of the existing AirTrain alignment could be rebuilt in the central terminal area to better integrate it with the existing or new terminals, giving passengers better or equal access to the check-in hall as well as curbside. The rebuilt station would be designed to accommodate longer trainsets and to facilitate one-seat ride service to the central business district (CBD). Create an express one-seat ride to Manhattan instead of extending the existing AirTrain. The new airport service would be an outgrowth of RPA’s regional rail plan. The Rockaway Beach Branch would be reactivated for passenger service from Atlantic Avenue, where it would connect to the new regional rail line at Howard Beach with two dedicated tracks for the airport service. The new airport express service would provide a quick one-seat ride from Midtown Manhattan, Lower Manhattan, and Downtown Brooklyn to JFK utilizing a new East River crossing. There would be at least four trains per hour with an average wait time of seven minutes. Protect JFK from storm surges: Unlike LaGuardia and Newark airports, JFK Airport is not significantly affected by sea-level rise, although the entire airport is vulnerable to flooding and therefore requires protection from storm surges. Strengthen connections between JFK and downtown Jamaica: Downtown Jamaica should be redeveloped in tandem with the airport. In particular, hotels and other hospitality services should be located downtown, preserving on-airport capacity for terminals, runways, and freight facilities. Protect and restore Jamaica Bay: Given the environmental impact of constructing one or two new runways into Jamaica Bay, various mitigation measures should be implemented by the Port Authority. First, every acre of habitat affected by the construction of runways should be restored elsewhere throughout the bay. Emphasis should be placed on restoring the salt marshes and maritime forests, as well as filling the holes made by excavations and restoring other bird sanctuaries away from flight paths. Further, the Port Authority should establish a Jamaica Bay Restoration & Resilience Mitigation Fund that will serve to fund research, restoration, and adaptation efforts to make Jamaica Bay and its communities more resilient. The fund could be managed in cooperation with a group such as the Science and Resilience Institute at Jamaica Bay or the NY-NJ Harbor Estuary Program. Funds could be raised out of the Port Authority’s general budget or a dedicated per-flight user fee. Further, the Port Authority should ensure the airport is among the most sustainable in the world, from including green infrastructure to carbon offsetting programs. Newark Airport should be reconfigured with a new main-terminal entry connected to public transit, a new western runway, and a midfield concourse. The airport should also be extended south for aircraft parking, add a modernized and more accessible air cargo area, and reduce noise impacts from the new western runway. Comprehensive adaptation solutions would address the risk of flooding of Newark Airport, the I-95 corridor, and the New York and New Jersey port facilities. Build Terminal A and AirTrain with a maximum 30-year design life: Construct the new Terminal A to operate for the next 30 years or more, until it would eventually need to be razed to make way for the construction of a new runway. The AirTrain system could be a short-term solution, or be replaced by a more-frequent bus service until a new system is in place in 10 to 20 years. Extend Newark Airport south to create a new cargo area and improve airfield operations: At only half the size of JFK’s, Newark Airport’s airfield is constrained. To accommodate future expansion, a portion of the new midfield concourse, and cargo operations, the airport will need to expand its footprint. The logical place for this expansion is to the south of the existing airfield, using a 600-acre industrial/commercial area between the airport and the old Central New Jersey rail line. Consolidate the existing Terminals C and B at the Northeast Corridor (NEC) rail station, with either one or two midfield concourses for boarding planes, and a new people mover serving the midfield concourses. Terminal A would be served by buses in the interim and eventually phased out after its useful lifespan, with terminal services moved to the NEC rail station. This new multi-modal hub will streamline the customer experience and result in more passengers getting to and from the airport by public transit. Extend the Port Authority Trans-Hudson rapid transit system (PATH) to Newark Airport. The new NEC headhouse would place the PATH at the entrance of the airport, making it effortless to transport baggage from transit to check-in. An extension further south to Elizabeth should be explored, which would open access to the airport to surrounding communities for travel and employment. Construct a new 9,000-ft runway on the western side of the airfield after terminal consolidation to the new headhouse on the Northeast Corridor is complete and the central terminal area is reconfigured. Adapt Newark Airport for storm surges and sea-level rise: Along with the Port of New York and New Jersey and the I-95 corridor, Newark is at risk of frequent flooding, with certain areas becoming permanently flooded once sea-level rise reaches six feet. Airport expansion will be one of the most expensive infrastructure projects the region will need to undertake over the coming decades. Total costs for both airports are estimated at $48 billion—$27 billion for Newark Airport and $21 billion for JFK—which would be paid for by Port Authority airport revenues derived primarily from airline fees and passenger facility charges. This level of investment would only be possible if airport subsidies to other Port Authority operations are phased out over time. Few major airports around the world subsidize other activities as New York does. Airport expansion will likely require a buyout of a few dozen residential properties to the north of the JFK runways, and industrial and residential properties to the south of Newark Airport. Mitigation measures should include a one-for-one replacement of any acres of natural habitat lost as the result of construction, with emphasis placed on restoring salt marshes and maritime forests, as well as filling holes made by excavations to fill the bay. A Jamaica Bay mitigation fund should also be established to fund research, restoration, and adaptation efforts.